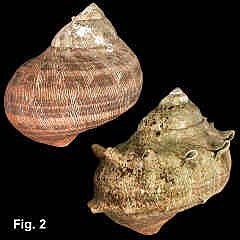 Description: Shell large, solid, whorls rounded; either smooth except for close growth striae parallel to lip, or with two rows of open-fronted spines on body whorl. Aperture almost circular, nacreous within; outer lip sharp, simple. Umbilicus closed, columella smooth. Exterior coloured with variable number of brown or dark green spiral bands on fawn background. Columella callous white, edged with green. 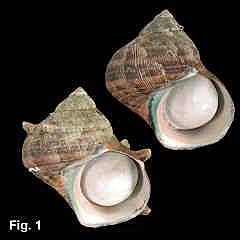 Operculum calcareous, almost circular; flat and brown internally, white tinged with green, domed and minutely pustulose externally. Size: Up to 102 mm in length. Distribution: Endemic to Australia: Alexandra Head, southern Queensland, to Sydney, NSW, but see remarks below. Habitat: On rocky shores, from low tide down to about 5 metres. Common. Comparison: A similar species, Turbo cepoides E.A. Smith, 1880, is common on Lord Howe Island, Middleton Reef and Elizabeth Reef, several hundred kilometers to the east of Sydney. It differs from T. militaris by having angled whorls and a different colour pattern. Synonymy: In Australian literature up to 1974 this species was listed under the name used here, T. militaris. Cernohorsky (1974) considered it to be T. imperialis Gmelin, 1791. The use of T. imperialis for this eastern Australian shell was perpetuated by Wilson (1993) and by Alf & Kreipl (2003). Unfortunately, Alf & Kreipl (2003, pl. 71) confounded the situation by illustrating shells from NSW and giving their locality as Western Australia (Kreipl, 2005, pers. comm.). Cernohorsky (1974) illustrated the holotype of Turbo imperialis, and gave the type locality as "China Seas", but Turbo militaris has a restricted range in eastern Australia. Cernohorsky's illustration of the type shows its shell shape and sculpture to be generally similar to smooth specimens of T. militaris. However, he describes the colour of the type as "decorated green with dark green spiral lines", which does not match the eastern Australian shell. For these reasons of restricted range and differing colour pattern I prefer to retain the eastern Australian shell as Turbo militaris. Remarks: A remarkable feature of this species is that most specimens are completely smooth, with a few showing incipient to strongly developed spines on the body whorl. Both smooth and spinose forms occur together on the same rock platform. It is not known if this variation is due to sexual dimorphism, ecological conditions, or some other factor. The distribution above gives the southern limit of this species as Sydney, as that is the southernmost record in the Australian Museum collection. In the 1970s it was rare around Sydney, but common in northern NSW. In 2005 it is common at Long Reef, Collaroy, and there are unconfirmed reports that it now extends as far south as Wollongong.